This is genuine government issue trip snare wire used by U.S. Forces in Vietnam. It is 24 gauge steel wire with a special, non-reflective, matte finish. Perfect for hundreds of uses including snaring and lashing. 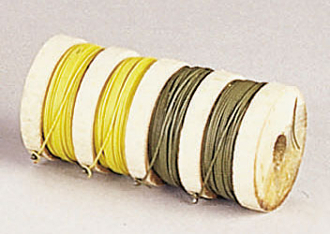 Each spool contains four 39 foot lengths of wire (2 olive drab & 2 tan colored), for a total of 156 ft. These are new govenment spools that have been in storage and do show some storage marks.